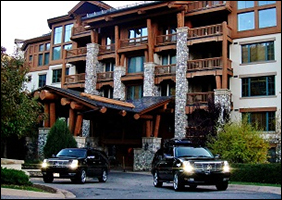 Black Diamond will take care of your transportation to and around Vail. Whether you are headed to the slopes, out shopping, or to another one of our beautiful mountain towns, call Black Diamonds today at to learn more about our rates and destinations. We offer private transportation service in our fleet of luxury Mercedes-Benz and Cadillac sedans and SUVS. Call us at (970) 261-6509 to inquire about our larger vehicles if you need more space for shopping bags, ski and snowboard gear, or for big groups. We guarantee we will get you to your final destination swiftly, safely, and in comfort.